We hope you’re eating great right now–we wish every year was as abundant as this, but in reality they seem to be few and far between. After 2009 we thought more highly of ourselves as growers, and that our soil had made leaps and bounds in health and nutrition available to our crops. But we were humbled as the next few years were nowhere near as productive, and we had some surprising soil-borne diseases on crops we didn’t even know could get sick. Oh you mean it’s the weather that really drives so much of farm productivity? Oh. Oooooohhh. So, we make it as resilient as possible to variations in weather, whether they be historically normal or modernly extreme, and then sit back and enjoy the ride. The variations in how we grow your food, from timing of plantings to tillage to probiotics — is fun and exciting, and keeps us always on our toes. Now is the time, even while we’re up to our eyebrows in this year’s harvest, we are thinking of lessons to be learned in this year and how to apply them for next year. We’ll walk the farm to assess the weed pressure in every field, make sure we have good notes on what to do and what not to do next time around, and analyze every step of the process to figure out how we can make this farm more durable and reliable as your source of yummy nutritious food. The other unusual timings are things coming early–the broccoli, cabbage, and beets have been enjoying this summer so much they just kept on growing! Usually they pause or slow down due to heat stress, cold stress, water stress, but not so this year. With the new well pump — an awesome investment increasing productivity of the farm and decreasing labor for the farmers this year — they’ve had ample water all along. But we’ve even withheld water — made them pant a little — to slow them down, but they’re still way ahead of schedule. So while we planned for abundant broccoli and cabbage throughout October, we’ll have some, but not what we’d like to have. And those beets, well they might just get huge, and they better not get tough, we’ll see. We’ll tweak our planting dates again, to try to be ready for anything, it’s amazing how there’s always more to learn and do better! The winter squash fields have been working hard non-stop since we planted them in late May, and soon the vines will finish their dying back to reveal how many colorful tasty squashes they’ve been nurturing under there! It’s one of the great mysteries of summer and fall, and harvesting them is one of the biggest projects of the year. As the different varieties are ready for harvest, first we’ll clip the stems off the vines, then place them in windrows (long lines) then pick them up into bins carried behind the tractor. Then the tractor (with a driver, yes) takes them to the greenhouse to finish curing, and when the flavor is peaking we’ll sort them, haul them to the barn and wash them in the brush washer (the same little green machine some of you have seen us washing melons in.) Whew. While there are many large harvests in the next couple months, squash defines fall for us, in its beauty, weight, amount of work and incredible sweet dense nutritional goodness. Walking around the farm this first day of September, it’s amusing and beautiful how the “Septober” weather is back. The farm shimmers in the crisp air and sharply gentle light, and even as things begin showing outward signs of dying, our work and home, our hearts and our bellies are full of great people and great food. We hope yours are too! Spinach is the new exciting item on the horizon, a wonderful addition to all this summer bounty. It loved the cool August weather, and appears to have done fine in the heat wave. First harvest should be this week sometime; we’ve planted lots and hopefully it will keep going til the end of October. The watermelons and cantaloupes keep getting better. We’ve gotten past the watermelons with hollow hearts and the rest are sweet and full and gorgeous. Same with the softness we’ve had in some of the cantaloupes– the muskmelon types, with the deeper ribs, are more prone to excessive softness, while the smoother, webbed cantaloupes are firmer-fleshed. The muskmelons are slightly more aromatic and complex in flavor, but more volatile and ready to jump over the edge into fermentation and/or moldiness. So we love both kinds. There looks to be about a week’s supply out there, maybe more, we’ll see. It’s been sweet and juicy, perfect timing with that heat wave! Tomatoes are still going strong, and are about to peak. We hope to have them in abundance for at least two more weeks, hopefully more, and then a trickle of one or two per share on through October. The overlapping of tomatoes and peppers with winter squash is one of the yummiest treats of a warm September. We are still taking tomato box orders this week and next. For Peppers, more are turning red now, so here comes even more sweetness from the fields! We pick some that aren’t fully red yet, but they’re good to eat as “bicolor” or they will turn redder if left on the counter for a day. If we left them all on the vine until they were 100% red, about half of them would start to rot. They’re like cantaloupes in that way–so sweet when fully ripe that the fungi and bacteria pounce on them quicker than they do on most foods. Eggplant is still going, yes, for a couple more weeks. These cooler temps are not it’s favorite, it will slow down some. Onions should be here all fall. Celery will be here until “tsorf”, and soon we’ll start picking celeriac (celery root) too. Lettuce and greens we should have all fall. We plant them every week for a continuous supply, and the last planting is in a few days. 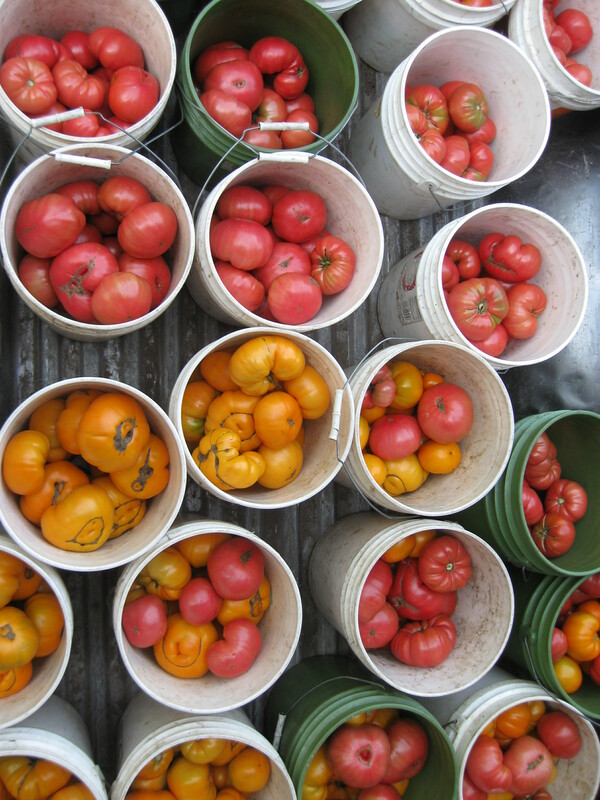 There’s still lots to pick, so if you’ve got any still laying around we need U-pick containers. Thanks for your help! Cherry tomatoes and green beans should be abundant until the cold takes them away. We’re waiting for the tomatillos to size up–they’re ready to pick when they fill out their husk– and we’ve realized they need a drink, so they’ll get it soon and should be ready in a week or two. There are still some ground cherries laying around, too. For herbs: cilantro, basil, dill, parsley, oregano, thyme, cutting celery, and marjoram. Basil will get brown spots and go patooey around 34 degrees–we don’t see it yet, but if it shows up in the forecast feel free to come out and pick lots to save. We like to cover some to keep it going, but the older plantings often have some that is good for gleaning on those final days. With the exception of dill and cutting celery, the other herbs are hardier and will keep spicing us up through October. Raspberries may be open for small quantities this week or next. Some rows did great, some are stunted (still learning why) and don’t have as much fruit. Overall the fruit is looking good. As for pests, there has been some of the fruit fly (Spotted Wing Drosophila or SWD) and now also some picnic bugs (black with yellow spots.) Both can be eaten –but the picnic bugs don’t taste very good and will occasionally bite your tongue and the fruit fly larvae — well, their beauty is in the eye of the beholder. The picnic bugs are easily spotted by checking any fruit that feel slightly soft, and they can usually be shaken out or picked out if you open up the fruit. The SWD larvae are harder to spot– the fruit often look just right but you can feel the bottom of the fruit is too soft, and if you open it up and look long enough, it seems like some seeds are moving around. Seeds don’t wiggle, so that’s the larvae. Some people eat these fresh, some freeze the berries or make jam to eat later and you can’t even tell they had a bug problem, and some people just choose to pass on the raspberries. You can choose, and as always let us know what you think. So for now, bug populations in the raspberries are lower than last year, but they are present. When picking starts please keep us posted. We are deliberating whether or not we should continue to grow raspberries, if we should spray organic pesticides, or plant something else in that spot — your comments and feedback are an important part of that decision so we love to hear from you. Most of our flowers are frost-sensitive, except calendula and one or two others, so pick like there’s no tomorrow. This week’s selection is : Lettuce Mix for $5 / lb, Carrots, Beets, Cucumbers, Zucchini, Summer Squash for $1 / lb, Asian and Globe Eggplant & Broccoli for $1.75 / lb, Collard Greens for 3.50 / lb, Watermelons and Cabbage for $.50 / lb, maybe Cantaloupes for $.85 / lb. Bulk tomato boxes, seconds, 12 lb for $18 or firsts, 12 lb for $24. Green and Red Peppers for $2/lb. We are open as usual on Labor Day, 2-6 pm. Have a great day! November Storage Share We’re still waiting to see how heavily some key crops will yield before finalizing the details; look for sign-up info in the next newsletter. Here’s some of the basics: This year’s storage share will be similar to the last four years’, varying according to this year’s yields. 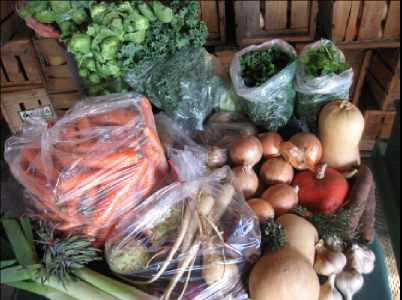 It is separate from the regular season share, a one-time pickup in November before Thanksgiving, and we hope it looks something like this: a big bag of super sweet fall carrots, a smaller bag of mixed fall roots, plus butternut squash, potatoes, kale, sweet potatoes, cabbage, Brussels sprouts, garlic, onions and leeks. All for $85, a fair and reasonable price for all of us. We provide info and inspiration on eating and storing all that goodness too! The picture below is most of one storage share. Let us know if you have any thoughts on it or questions about it as the fall goes on, and look for more details and the chance to sign up later in September. For potatoes for sale this fall, we’ll hopefully have some coming from a farmer friend in the next couple weeks. They’ll be near the sign-in table, keep your eyes peeled. 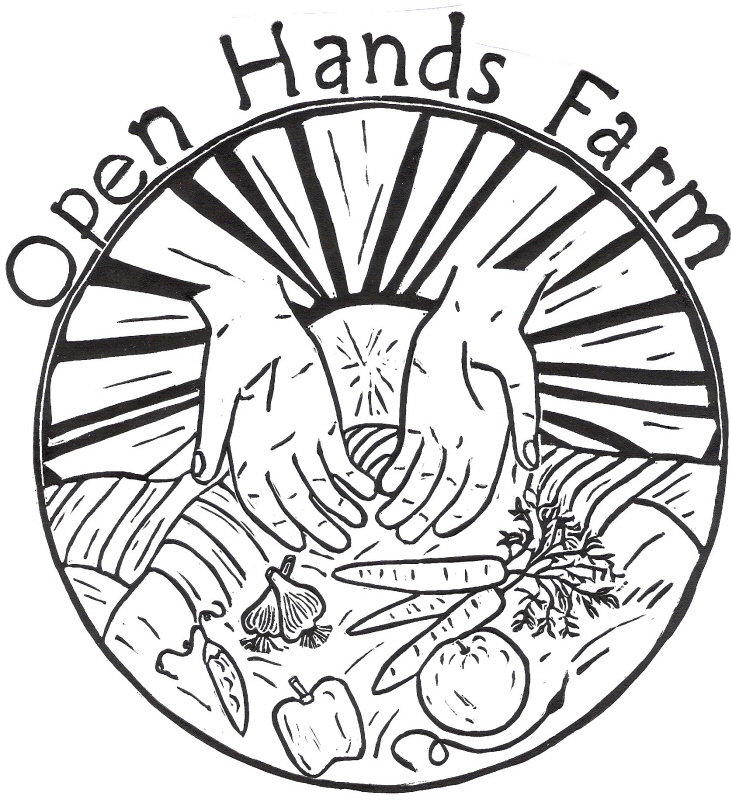 You can still donate to EFN’s Harvest for the Hungry — and get more local produce into the emergency food system. This program of the Emergency Foodshelf Network has been purchasing lots of surplus produce this summer, and is running low on funds. Your donations and/or drinking Finnegan’s Beer can help people eat better! For more details see our last newsletter. Preheat the oven to 400 degrees. Lightly grease an 8 or 9 inch square baking dish with olive oil. Arrange the eggplant slices on the baking sheet, season with salt, and lightly brush the tops with olive oil. Bake until eggplant is soft and golden, about 20 minutes. Transfer the eggplant to a plate and set aside to cool. Toss the peppers with a few dashes of olive oil in a medium bowl. Spread on a baking sheet and bake for 10 minutes. In a large bowl, mix the ricotta cheese, egg whites, ½ cup of Parmesan, basil, parsley, cayenne pepper, and a generous dash of salt until all the ingredients are well combined. Arrange half of the eggplant slices in the baking dish. Spread the ricotta mixture evenly over the slices. Pour half of the tomato sauce evenly on top. Sprinkle with mozzarella cheese. Arrange the pepper and olives on top of the mozzarella. Top with the remaining tomato sauce. Add the remaining eggplant slices and sprinkle with the remaining Parmesan cheese. Bake until all the layers are heated through and the cheese is melted, about 45 minutes. This variation on pesto is so delightful it’s amazing that it’s not more common. The roasted tomato flavor is superbly highlighted by the sweet aromatic basil—but a very ripe regular tomato will work well too. Don’t limit this pesto to just pasta; try it on pizzas and roasted potatoes, in an omelette, or over grilled vegetables. You can make an equally delicious variation by using cilantro instead of basil. (adapted from the Seed Savers Calendar, 1998). 1. Combine the tomatoes, garlic, pine nuts, and oil in a blender and process until just combined. Add a handful of basil and process again briefly; continue adding the basil in small amounts until all is combined.